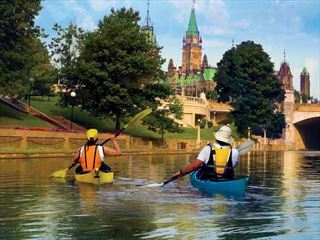 A captivating blend of old and new, this Eastern Journey is the perfect way to experience Canada’s unique history, Old World charm and bustling urban landscapes. 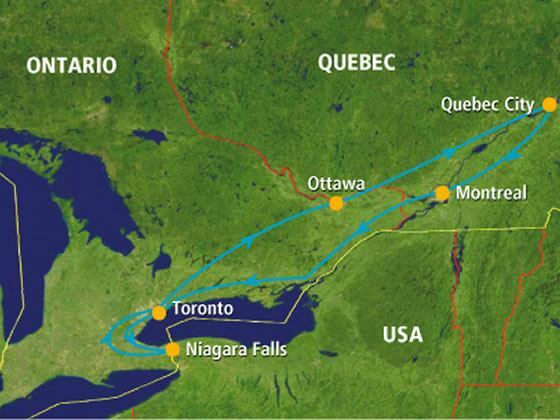 On this unforgettable adventure, you will explore Toronto, the majestic Laurentian Mountains, Niagara Falls, the picturesque Thousand Island region, historic Quebec City and end your trip in Montreal before returning to Toronto for your departure. Arrive into Toronto’s Pearson International Airport and transfer independently to your downtown hotel – check in with your Tour Director then explore for the remainder of the day at your leisure. 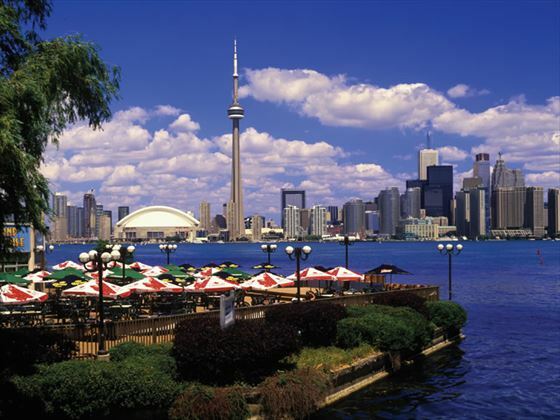 This vibrant and dynamic city boasts a wealth of delights to explore, from the colourful neighbourhoods to the views from the top of the CN Tower; the lively theatre district and the bountiful restaurants. Take time to people-watch from one of the numerous cafes and take in the atmosphere of this special city. Overnight: Courtyard by Marriott Hotel Toronto Downtown. Meet with your fellow travellers in the morning before setting out to explore the varying personalities of this fascinating cosmopolitan city. Beginning with the provincial parliament buildings, the waterfront, the imposing CN Tower and bustling Chinatown, you’ll leave the city to head towards the Niagara Peninsula. 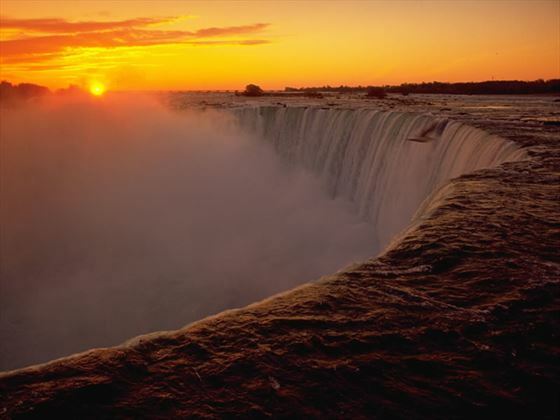 Passing through the charming town of Niagara-on-the-Lake, you will follow the scenic Niagara Parkway in order to reach the majestic falls. You’ll have plenty of time to admire the view and even take part in some activities – just be sure to remember your camera to capture the sensational views! 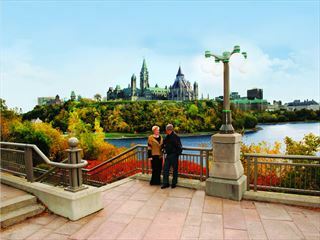 Today you’ll leave Toronto to drive east towards Ottawa, where the route winds through rolling farmlands and the lakes of the Rideau Waterway. 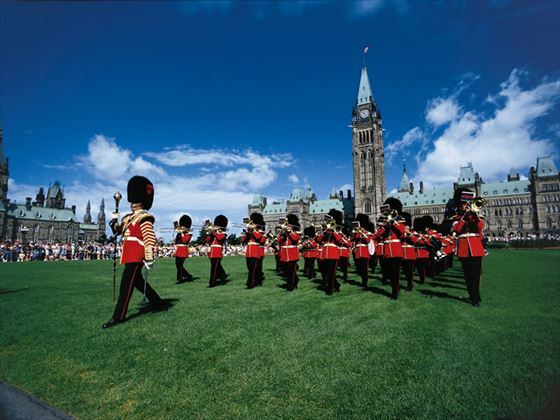 Once you arrive in Ottawa, you’ll take part in a sightseeing tour of the national capital, including the Rideau Canal (also a UNESCO World Heritage Site) and the government buildings on Parliament Hill. There are numerous sights to be found here, such as the picturesque public gardens and the Byward Market, making for an interesting and memorable day of sightseeing. 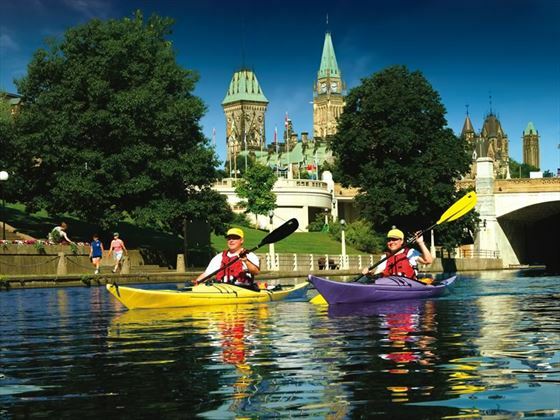 Today sees you travel along the scenic Ottawa River to the French-speaking province of Quebec. Following the Chemin du Roy Highway past the magnificent Laurentians, you’ll journey past rustic Quebecois villages and shrines which are steeped in history. 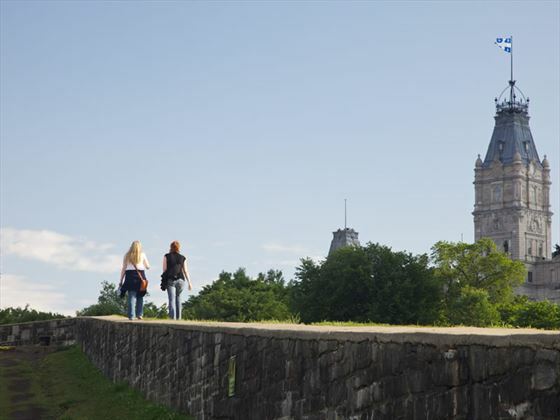 You’ll end the day in Quebec City with a tour within the walled old city, viewing the ornate city gates, Lower Town, the Battlefields and the Citadel. Today is yours to spend at your leisure, exploring the sights of this amazing World Heritage Site. There is an optional full day excursion to Tadoussac which includes three hours of whale-watching on the St. Lawrence River at the mouth of the Saguenay River on a boat. Once you’ve returned you’ll visit the Montmorency Falls which tower a mighty 30 metres higher than Niagara Falls, powering an astonishing 35,000 litres of water per second over its edge. The remainder of the day is yours to spend at leisure – why not go shopping in the quaint boutiques or wander the narrow streets admiring the architecture? 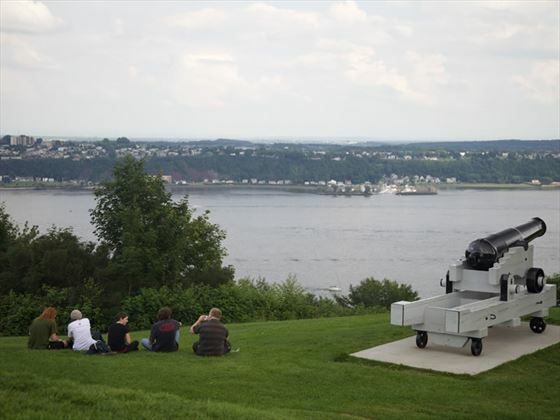 Leave Quebec City today to drive along the St. Lawrence River on your way to Montreal. This vibrant city offers a unique and fascinating blend of history and modernism, encapsulating the two founding cultures of the city itself. 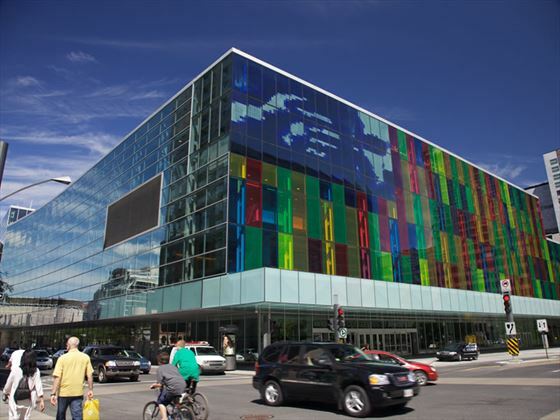 You’ll take part in a tour of the downtown area to view the Olympic Complex, as well as Old Montreal, McGill University, the residential streets of Mount Royal and the lively shopping streets. 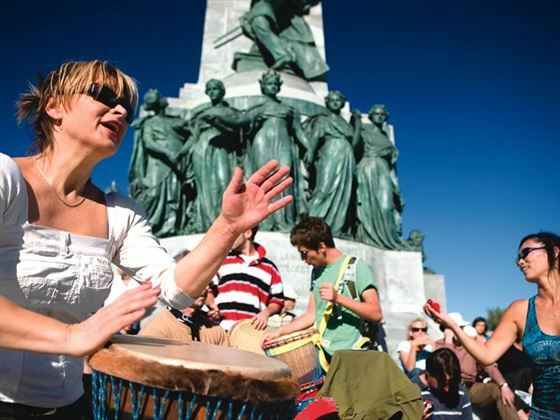 In the evening, there will be an optional dining excursion and a chance to experience Montreal by night with a scenic trip out on the town to one of the city’s most popular Greek restaurants. You’ll head back to Toronto today where you’ll explore the neighbourhoods and sample the local cuisine in some of the best restaurants in the city. In Rockport, you’ll also have the option to enjoy an entertaining and relaxing cruise through the beautiful group of 1000 islands. The time has come for some last-minute shopping and to say farewell to Canada.